RRB ALP Technician Recruitment 2018 – Railway Loco Pilot 26502 Vacancies: Assistant Loco Pilot (Driver) & Technician Vacancy in Indian Railway is around the corner. Are you looking for RRB Railway Driver Recruitment? The wait is finally over, The Railway Recruitment Boards (RRBs) is finally all set to issue an Employment Notification for the recruitment of ALP & Technician posts. 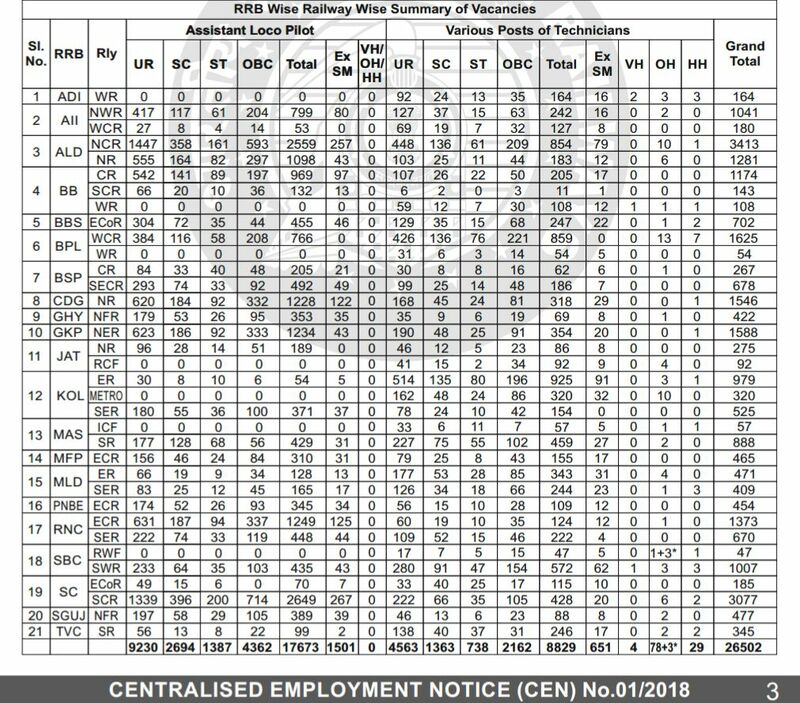 Online applications will be invited from Indian Citizens for filling up 26,502 Assistant Loco Pilot (Driver) and Technician vacancies in various Railway Board/ Zones including RRB Ranchi, RRB Kolkata, RRB Mumbai, RRB Secunderabad, RRB Allahabad and other railway boards. Official Notification of RRB ALP, Technician released. Eligible and interested ITI Pass out candidates can apply for Railway Drivers (Loco Pilot) vacancies as a part of RRB ALP Technician Recruitment this year. Further details like Age limit, Educational qualification, Diploma/ Degree, Last Date, Board wise vacancy and other details are given below. Age Limit: Candidates age should be between 18 years to 28 years for Assistant Loco Pilot posts and Technician posts. Age relaxation is applicable and it will be calculated as on 01-07-2018. Educational Qualifications: Candidates should have passed Matriculation/ Class 10th Exam and must possess the qualification of ITI (NCVT/ SCVT) from any recognized board or institutions for Assistant Loco Pilot (ALP) posts. Passed in Inter (10+2) exam is must for Technician posts in Indian Railway. Application Fee: General candidates will have to pay Rs. 500/- while SC/ ST/ Ex-servicemen/ PWD/ Women candidates will have to pay Rs, 250/- as application fee. Application fee should be paid either through Online using internet banking or Debit Cards or through Challan in any branch of SBI/ Computerized Post Office Pay-In-Slip. Selection Process: Selections of candidates will be made on the basis of their performance in Computer Based Test (Online) written examination and skill test if applicable. How to Apply Online: All those candidates who wish to apply for RRB Loco Pilot Vacancy though Railway ALP & Technician Recruitment in Indian Railway, they are required to apply through online mode at RRB website on or before this year 2018. RRB ALP & Technician Online Application: Before start applying online for Railway Driver vacancies, candidates must have valid Email ID & scanned copy of photograph & signature. Navigate to Online Application Link at www.rly-rect-appn.in. Select the Railway Board You want to apply for Loco Pilot post. Now click on "Apply Online" link. Pay Application fee using Debit Card, Internet Banking etc. At last, Take print out of application for further use. More Details: Candidates are strongly advised to read official recruitment notification for detailed information about RRB ALP & Technician Recruitment for Railway loco Pilot vacancy regarding age limit, educational qualifications, last date, pay scale, how to apply and online application form.